There are millions of poorly designed websites on the internet which don't do justice to the business or school they represent. Bad website design, out of date information and poor functionality are the three main reasons people will quickly leave a website and may then click on your competitor's site. At Uedit Kendal, Cumbria, website designers we specialise in creating websites which look professional and the client can easily update themselves, ensuring you will always look your best on the internet. Out of date websites look bad for you and your business. Paying your web company to make little adjustments to your site is expensive. We create beautiful, professional websites that work brilliantly and you can edit whenever you want at no extra cost. Our websites are ideal for tradesmen, small businesses and we also build ofsted compliant school websites. 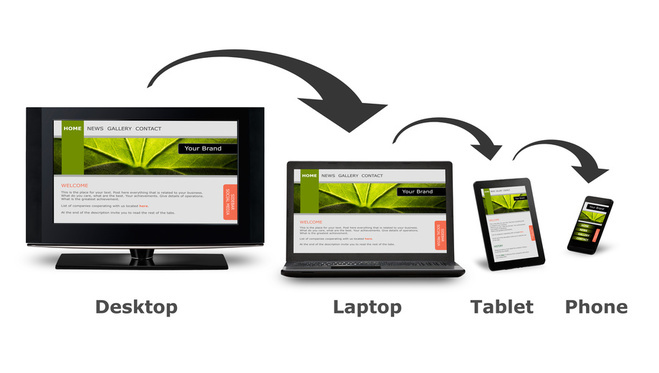 Because people want to view your website on a wide variety of devices including smartphones, tablets, desktops, laptops and smart TV's the screen size will vary widely. It is important that whichever device your audience is using your website automatically adapts to make viewing and navigating the site clear and simple. Whether you are looking for a simple two or three page website to showcase a small business, or need a much larger professional website for a school, we can cater for your needs. We are trusted by some of the UK's biggest companies and charities. We won't blind you with jargon, just build you the website that's right for you.